This is a more advanced section of the website, and is intended for older children and adults, as the tools and materials involved can be dangerous. 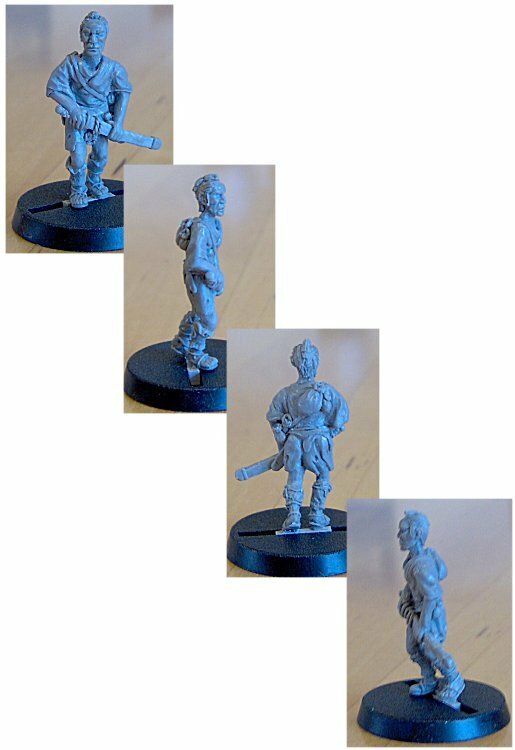 Here you will how I sculpted a 28mm miniature figure. 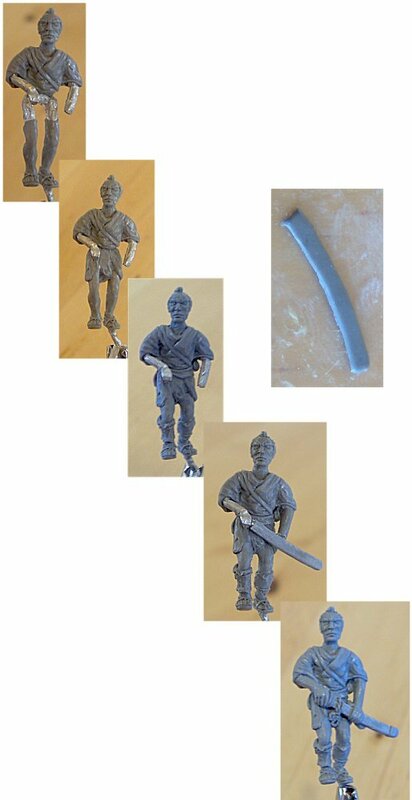 This figure was done with the left over bits of putty from sculpting the 54mm Polo player, while that model was curing. I don't like to waste putty or time! 1. 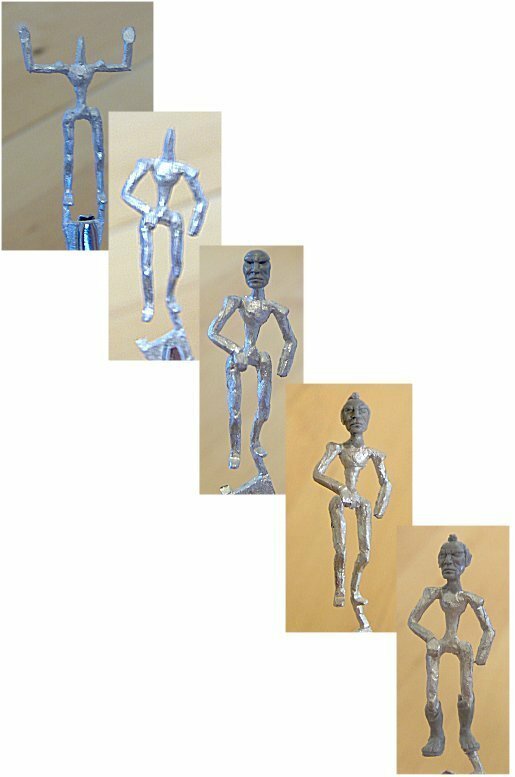 I started out with a ready made armature. There a a lot of these on the market - this one came from Jeff Valent studios. 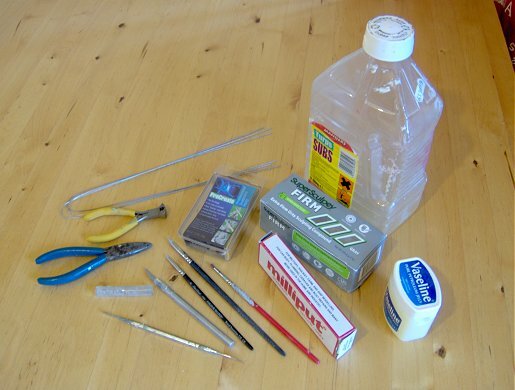 I generally make my own armatures from wire, but I'll describe that another time. 2. I then bent the armature into the position I wanted, advancing a preparing to draw his katana. 3. I sculpted the face in one go, using the method described in our Face Sculpting tutorial. I added hair and ears after the face had cured. 4. Then I added his lower legs and feet with sandals. 5. I then did his upper body clothing in one go. i used a single lump of putty, and shaped it. I find that much easier to get smooth than adding pieces of putty. I made him quite thin and scrawny, because he's a lordless ronin. 6. Next I added his lower clothing, making it look quite rough and worn. While that was curing rolled out a piece of putty for his katana's scabbard. I put a thin length of wire into it, for strength, and smoothed it out on a sheet of acetate. Then when it was dry I peeled the acetate off, and sanded the putty smooth with 600 grade wet-and-dry paper. 7. Then I added his belt, using the stickiness of the fresh putty to attach the scabbard as well. 8. Once it was cured, I added the arms and hands. 9. Finally, I added the hilt of the katana, and a few packs and bags to show he's a wandering ronin, and also to fill the gaps!. After adding a tab to his feet for basing, he was finished. My first 28mm figure - I was well pleased!